A BPKI Certificate (also known as a client X.509 certificate) is a Digital certificate provided to identify the holder of such certificate while performing online transaction. 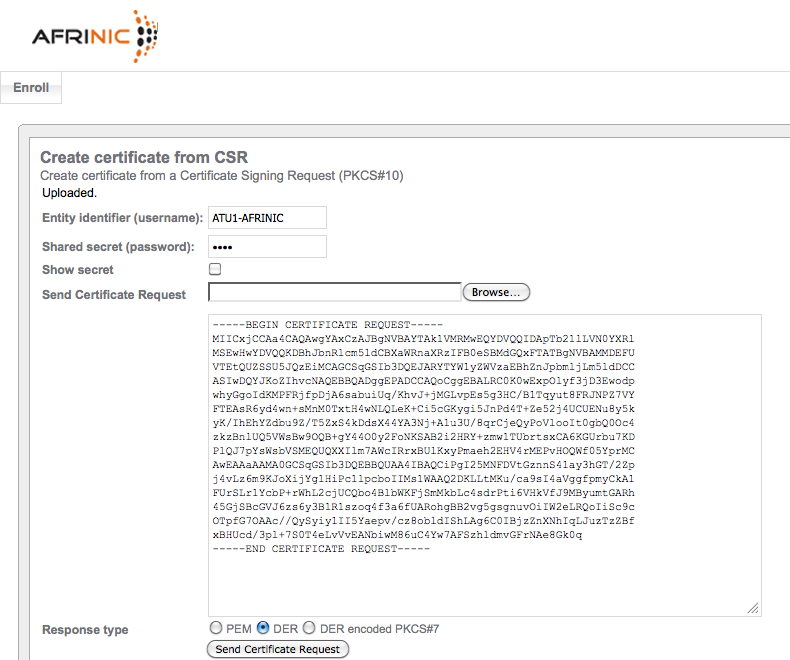 In case of AFRINIC, the client certificate delivered will hold your NIC-HANDLE as Common Name (CN). AFRINIC BPKI certificate will be used to digitally certify Organisation members right to perform and access certain services online such as RPKI and Board Election. The Digital Certificate issued by AFRINIC allows us to confirm that you are indeed the representative of a member organisation exercising your right to vote. The enrolment of your certificate is a process by which your Digital Certificate is integrated into your browser to be automatically used for authentication purpose. The process of this integration is not the same for all browsers. The process pre-defined in the engine we use at AFRINIC is only compatible with Firefox. We are working to extend this to as many browsers as possible. Who can vote in my Organisation? Any Administrative contact or any registered contact that has been assigned the ‘Voter’ role can cast a vote. Any Administrative contact or any registered contact that has been assigned the ‘Voter’ role can cast a vote. If you do not see the link to the vote, this means that you have already been issued with a Proxy for the vote. In such case, you cannot exercise your right of vote online anymore. You need to sign the Proxy document and give it to your representative for an onsite vote. This is because you have not been assigned the ‘Voter’ role. Only administrative contacts of the organisation can appoint the ‘Voter’ role. check that the e-mail address associated with the NIC-HANDLE is valid. The Administrative contact of my organisation is not available to approve my BPKI. What can I do? Unfortunately only the Administrative contact can approve a BPKI certificate. Unfortunately only the Administrative contact can approve a BPKI certificate. How can I verify my vote? There is an integrated process to allow anyone who casts a vote to verify the validity of your encrypted vote. There is an integrated process to allow anyone who casts a vote to verify the validity of your encrypted vote. Each election has a designated set of Trustees. For Board election, the Trustees comprise the Chair of the NomCom, the Chair of the Election committee, and AFRINIC legal counsel. You will need a valid ID to collect your Ballot. The ID is checked against the name registered in MyAFRINIC as Organisation contact or Proxy Holder. You will not be able to collect your ballot without a valid ID. When you cast a vote, you will receive a unique ballot tracker number, which represents and identifies your encrypted vote in the database. A BPKI certificate, also known as a client X.509 certificate, is used to identify a user or a client. They are meant for authenticating a client to a server. In the case of AFRINIC, the client certificate delivered will hold your NIC-HANDLE as Common Name (CN). You must be an authorised contact of your organisation to obtain a BPKI certificate. A BPKI certificate is needed to access Resource Certification (RPKI) services. To request a BPKI certificate, connect to https://my.afrinic.net and navigate to "My Account > BPKI". Scanned copy of an official Government/State-issue ID, passport, driver's license or company'ID card. If you are a technical, billing, abuse or general contact, you will be asked to request a BPKI certificate by clicking on the "Request BPKI certificate" button. Your request will be sent to all the Administrative contacts of your organisation. You need to follow up with them to know the status of your request. An email is sent to all admin contacts of an organisation when a non-admin contact makes a BPKI request. Below is an example of an email sent to administrative contacts. To accept a BPKI request made by non-admin contacts of the organisation, navigate to "My Account -> BPKI". The system will grant you access to this section only and only if you (as admin-contact ) already have a valid BPKI certificate. If not go back to step 2.1. You can then accept or reject a BPKI request of somebody from your organisation. To enrol your BPKI certificate you will have to connect to the External RA(Registration Authority) service. Please fill out the information requested for the CSR. 3) You should leave the challenge password blank otherwise the system will ask for the challenge password everytime the certificate is used. Next, navigate to https://externalra.afrinic.net/externalra-gui/facelet/enroll-csrcert.xhtml and input the credentials received in your invitation email and click "browse" to select the CSR freshly generated. 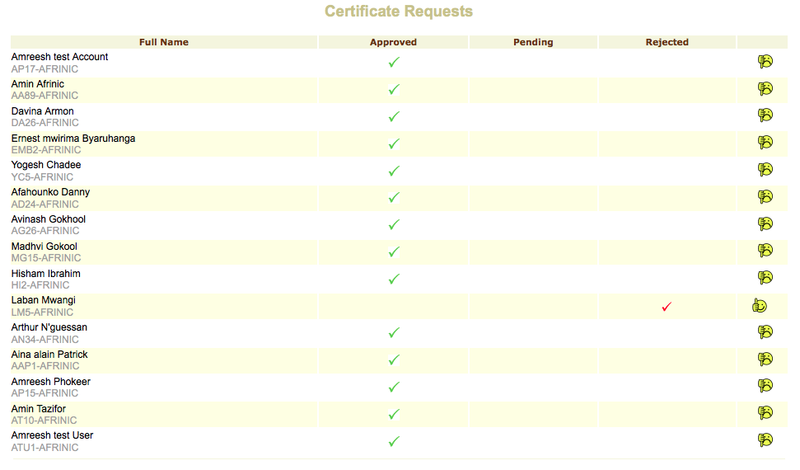 Make sure you select "PEM" and click on "Send Certificate Request". A certificate in pem format will be downloaded. Save it to the same folder as the CSR and private key generated under the name .pem. Select "Show advanced settings" and under HTTPS/SSL click "manage certificate". Import the certificate into your login keychain. Open recognizes either the .pfx or .p12 extension and will open the keychain so you can import the certificate. Even though you can import your certificate to a series of different browsers, the only currently supported browsers to access BPKI-restricted sections of MyAFRINIC are Chrome and Firefox. Bravo! 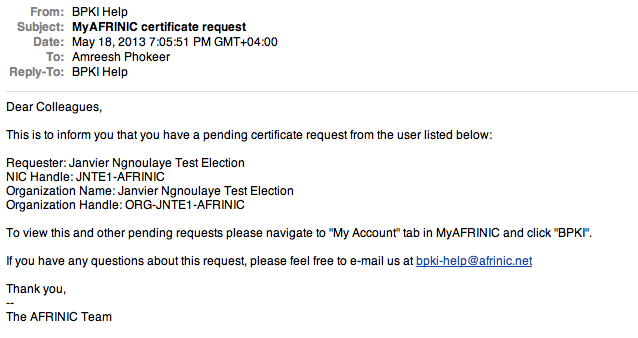 You now have a BPKI certificate installed in your browser and you can now securely authenticate yourself to MyAFRINIC.